AngloGold Ashanti (NYSE: AU) remains the largest position in the John Paulson’s Advantage Fund (see more of John Paulson’s top picks). AngloGold Ashanti is the third largest gold producer in the world, behind Barrick (NYSE: ABX) at number one and Newmont (NYSE: NEM) at number two, with annual output of over 4.3 million ounces. It has a number of new projects coming online that will boost annual production to an estimated 5.5 million ounces by 2015. Paulson & Co.’s 2011 production estimates for Barrick is 7.7 million ounces and for Newmont is 5.2 million ounces. With mines in the United States, South America, West Africa, and South Africa, AngloGold Ashanti has a global presence. When the new management team took over in late 2007, it set to turnaround the business by: eliminating the hedge book, improving safety, restoring growth, and diversifying out of South Africa. Management completely eliminated the hedge book by October 2010, fully exposing AngloGold Ashanti to the spot price of gold. Management was successful in its other initiative to improve the AngloGold Ashanti’s safety performance. AngloGold Ashanti’s safety statistics have shown meaningful improvement, and “in the four and a half years to June 2011 the Company’s injury frequency rate declined by 63%.” With the operational turnaround under its belt, management’s focus has shifted towards delivering future increases in production. The new projects in the United States, South America, and Continental Africa are expected to increase production by 27% by 2015. This enhancement of production growth y-o-y will be an important factor in driving stock price performance. AngloGold Ashanti has recently begun commissioning the new Corrego do Sitio mine in Brazil, and has initiated construction activities on the Tropicana mine in Australia and at the Kibali joint venture in the DRC. Two development projects in Colombia can potentially begin to contribute around 2020. When the market acknowledges AngloGold Ashanti’s achievements, the shares should outperform. Improvements in the Company’s balance sheet and operational performance as well as international growth opportunities have not been lost on credit rating agencies. Recently, Moody’s upgraded its rating from Baa2 from Baa3, recognizing improvements in the fundamentals. The increase in operational strength positions the Company well for hefty upcoming capex budget over the next three years, approximately $2 billion in FY12. This will be supported by strong cash flow generation. During FY11, AngloGold Ashanti generated $833 million in free cash flow. From a debt perspective, AngloGold Ashanti has indicated that it has the capacity to increase its net debt balance to $1.8-2 billion, as needed. We believe this upgrade may improve AngloGold Ashanti’s cost of capital and generally speaking we believe management will manage the Company’s leverage appropriately. Despite this strong financial performance, the shares declined by 13.8% in 2011. AngloGold Ashanti shares are now trading close its 52-week low of $37.42, presenting an attractive opportunity to initiate a position. Despite AngloGold Ashanti’s strong operational performance, it trades at a discount to its peer group. Paulson estimates that AngloGold Ashanti shares trade at 6.9x EV/EBITDA versus other large producers that trade w at much higher multiples, Harmony (NYSE: HMY) at 10.5x, Newcrest (ASX: NCM) at 11.1x, and Goldcorp (NYSE: GG) at 13.0x (based on February 7, 2012 closing prices). Furthermore, earlier this month, AngloGold Ashanti announced its planned, $335 million acquisition of the Mine Waste Solutions assets of First Uranium (FUM). AngloGold Ashanti has had a 20% stake in FUM since 2011 with its eye on a growth strategy in the Vaal River region. We believe this to be a smart tack-on acquisition for AngloGold Ashanti as there are significant opportunities to achieve synergies since AngloGold Ashanti already has a prominent presence in the area. Management expects that this will add 75,000 to 80,000 ounces to its total output and provide further gold and uranium production upside. Importantly, this acquisition a substantial capital investment that would otherwise be required to construct a plant to process its Vaal River tailings, and reduces long-term potential environmental liabilities. We see additional value in adding capacity (aside from the R100 million capex AngloGold Ashanti has set forth) to increase existing uranium capacity and/or acquiring capacity to treat regional tailings that would serve to manage the risk of future environmental liabilities. From a macro point of view, we are bullish on gold for the long-term, as is George Soros, given unprecedented amounts of quantitative easing by central banks and the sovereign debt crisis in Europe. And at these prices, gold and select miners present a favorable risk reward profile. AngloGold Ashanti is our pick among South African miners. We like that the Company has entered a growth phase and that its strategy is to diversify into promising regions like Australia, Brazil and Colombia. While stock price performance has been disappointing in the short-term, AngloGold Ashanti’s strong fundamentals should eventually be reflected. Hedge Fund News: Klarman, Buffett, Rogers, Lampert, Ackman… Hedge Fund News: Bill Ackman, David Einhorn, John Kinnucan, Ray Dalio… Hedge Fund News: Brevan Howard, Jim Rogers, Bridgewater… Hedge Fund News: Peter Schiff, Jim Rogers, Marc Faber, John Paulson… Hedge Fund News: Feds Taped Cohen, Dalio Made $3 B In 2011, Insider Trading... Guess How Much John Paulson Earned in 2010 and 2011 Combined? 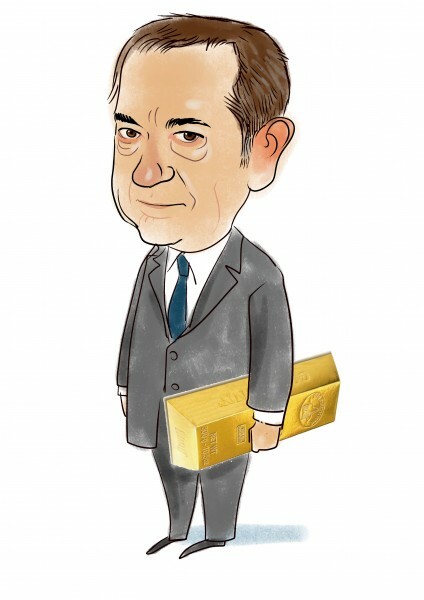 Best Gold Stocks Hedge Fund:18 John Paulson - Paulson & Co.